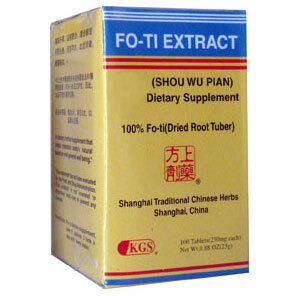 Fo-Ti Extract (Shou Wu Pian) promotes blood circulation and supports the health of the blood, the kidneys, scalp, and hair. Nourishes the liver and kidney. Nourish blood, replenish essence (jing), tonifying the Qi, release toxins, and promote hair growth. Shou Wu Pian promotes blood circulation and supports the health of the blood, the kidneys, scalp, and hair. Nourishes the liver and kidney. Nourish blood, replenish essence (jing), tonifying the Qi, release toxins, and promote hair growth. As a dietary supplement take 5 tablets 3 times a day.